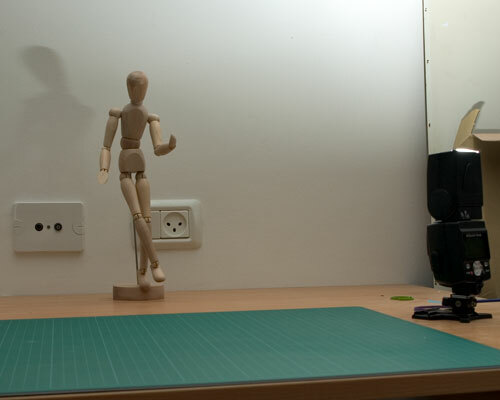 So, I was trying to make a nice lighting for a still life picture I was taking. Sadly, I had none of my usual crap around. I was at lost. Suddenly, I heard a distant voice, telling me to to try something I’ve never done before and to try some new cheap way to take the picture, also to try and keep it innovative, and low cost (shuold be read “I have no money for gear, so I cant afford the stuff I really want). This is the time to take a short break, and talk about that distant voice. It is not uncommon for me to hear voices in my head – nothing big, no one has ever told me to climb a water tower and go postal. yet… It’s just your usual voices – “you can snooze for 5 more minutes, the meeting will be delayed anyway“; “let Liry (my daughter) have another chocolate bar, mommy wont care“; you know, the usual things…. lately I’ve been hearing a new voice. In fact this voice is so load that it even dumps some of the older voices that tells me to buy more stuff to complete my poor photo gear collection. This voice is simple, it has a repeating mantra – “buy less, think more”; or somtimes “dont throw this away, you might need this for tomorrows shot”, or “I love Pizza”. This voice echoed some of my dipper thoughts, so I went to find the source of it. It didn’t take me long to find it. It’s called the strobist , and the ideas there are much in sync with the ideas in this site – Do It Yourself. Also I have learned much from reading the strobist blog – not to mention an occasional laugh. So Strobist – thanks for sharing – this post’s for you! Now back to my lighting dilemma. A direct flash was out of the question. 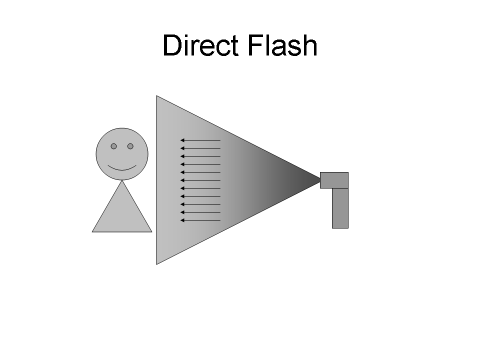 the light coming from a direct flash has two major downs. 1 – you get hot spots – bright shiny dots of light. 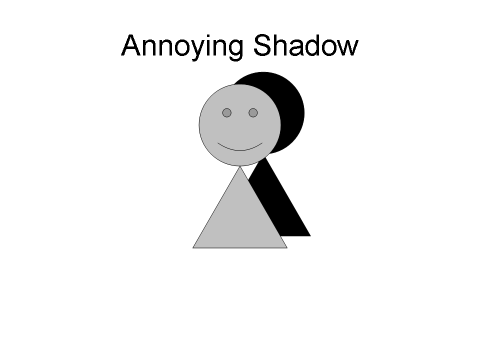 And 2 – you get harsh shadows that are really annoying. Luckily I have a pc-sync cord so I can go off camera with my flash. (I ordered a radio trigger from eBay, it should be a big improvement to my current setup – I’ll follow up on that soon) Here is a shot taken with direct flash. 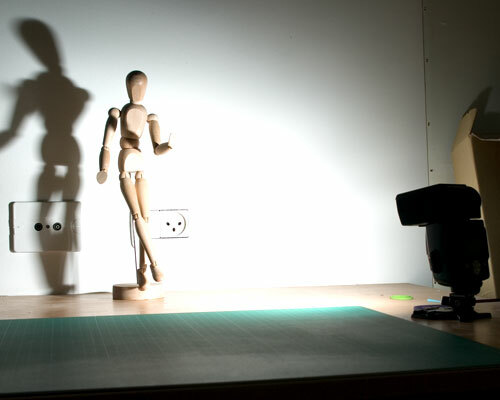 and here are two diagrams that shows the light path for the direct flash and the shadow pattern for this shot. So direct flash was out for this shot. And I knew I want to do an off-camera flash thing. The usual solution for this problem is to bounce the flash from the ceiling. you get nice even light and little hot spots. IT works best if you have a white ceiling at one of your rooms in the house. (Yes this is the same room that you told your wife that “Honey – can I do some photographing experiments in the computer room? I’ll clean everything tonight” – that was a year ago, today this room looks nothing like a computer room and allot like an improvised studio). The problem with bouncing off the ceiling is that you get very boarding light. no drama. The light is even on all sides, and the final picture looks kinda flat. 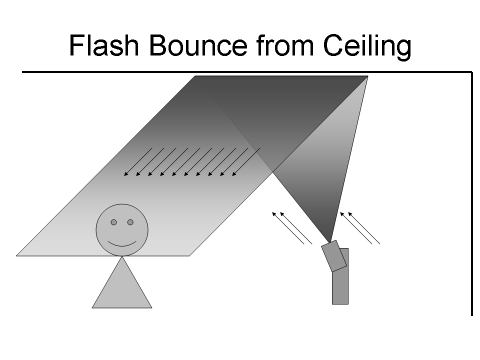 Again here is a shot taken with the flash bounced and a diagram to explain the light flow. This is a bit better – no hot spots and the shadow is not as bad. The light is coming from all directions with the same intensity, and all the sides are getting the same light. There are no shades. So I was wondering, how can I use my flash in a way that will have both drama and soft light? but wait!! 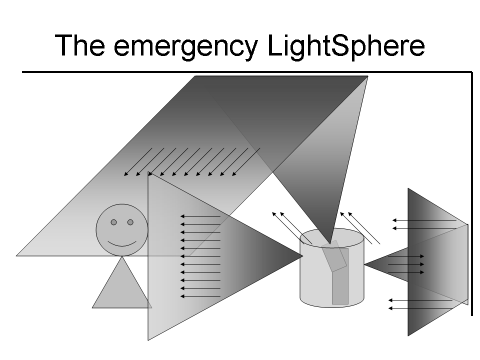 there is something that does just just, it’s called Light Sphere II. nice! but A – this gizmo costs like 50$. and B – I don’t have one. So there I was when it hit me. I was at the super market that day and have the nylon bag I used for taking the shopping home. Usually that is bad. Nylon is the anti-crist of enviroment, but this time it plated for my favor. Here is the setup: I placed the SB800 in a 45 degree angle and placed the nylon bag over it. see the picture below for the results. it has both drama and diffusion. Here is the diagram that explains it. The light is reflected inside the bad and goes to all directions. The entire room behaves like a huge softbox. 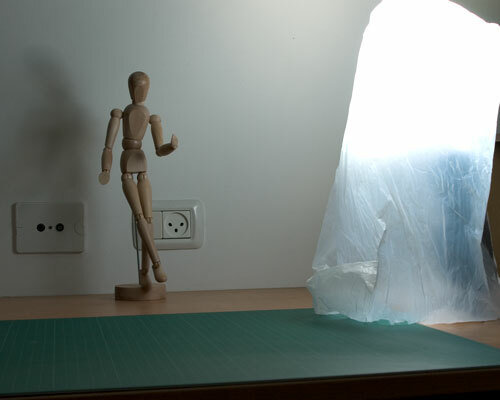 At the same time, a stronger beam of light is directed to one side of the bag, resulting in more light coming to the side facing the flash.